You can’t escape this pun when you visit Ithaca. But why would you want to? 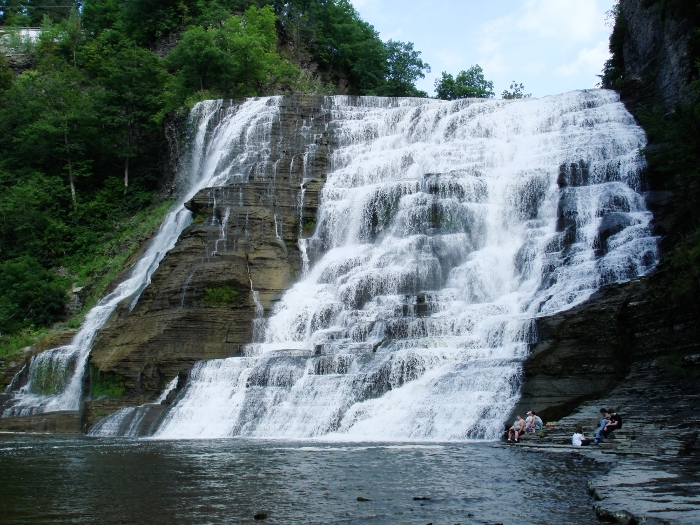 A four-hour drive from Manhattan without traffic, this rural corner of New York State offers up great hikes through ravines and past beautiful waterfalls. It’s a geological novel up here. If you’re visiting Cornell’s campus or staying near Ithaca’s downtown, swing by the Cascadilla Gorge. Here, water slips, slides and pours down over the shale, siltstone and sandstone. The sedimentary rocks fracture almost perfectly along horizontal planes, resulting in dramatic waterfalls. Water hits one step, glides along and then promptly tumbles down another step, again and again. The horizontal fractures also give rise to peaceful, wide-open areas of river. When school is in session, students and visitors splash and giggle as they walk along the smooth flat floor of the valley. The water slips serenely over their toes as the visitors pose against a backdrop of waterfalls. The water tumbles down a total of nine falls. At the same time, the trail besides it climbs 400 feet from downtown Ithaca to Cornell’s campus. This gorge marks the southern edge of campus. When I climbed the trail with friends, I was positively pooped by the end. I found respite in the atrium of Cornell University’s Snee Hall. The Timothy N. Heasley Mineralogy Museum resides here. The museum has layers upon layers of glimmering gems and minerals in glass cabinets: emeralds, rubies, black opal, and many, many more. There’s even a display of fluorescent minerals tucked in the back. These minerals shine with an otherworldly glow under ultraviolet light. More gems lie right outside the museum, but not of the jewel variety. Rather, these are artifacts of natural history. Real dinosaur tracks line one of the walls. The ancient footprints, encased in mud, and then solidified into rock, sit mounted on one side of the space. In a case nearby, the needle of an operational seismograph station solemnly draws its jagged line. Up above you, a plesiosaur, which looks like the Loch Ness Monster, hangs frozen mid-swim. Ff you have a car, you should spend a day or two visiting the trails and assorted gorges nearby. Watkins Glen State Park, just south of Seneca Lake, is an special standout. There are several paths along the gorge where you can walk by — and sometimes under — the park’s 19 waterfalls. Cliffs here reach as high as 200 feet, and a second trail loops around the valley’s edge. There’s a camp ground if you want to extend your stay past a day trip. Why is the landscape so stunning here? As some of you may have already guessed, glaciers have something to do with the landscape’s beauty. But first, we need to go further back in time. Back about 450 million years ago, a shallow Devonian sea covered upstate New York and much of the American interior. Rocks from the now-eroded Acadian Mountains fell into this sea by way of a massive delta called the Catskill Delta. The cycle of marine life, mixed with the fallen rocks, eventually formed the shale, siltstone, and sandstone bedrock of Ithaca. Fast-forward 300 million years (we’re on the geologic timescale here), small fingers of magma pushed their way up from the mantle amongst these sedimentary rocks. These fingers, called kimberlite dykes, are named after the South African town of Kimberley whose kimberlite dykes kick-started the modern diamond industry. There’s even one dyke which runs right along the gorge trail and under Snee Hall itself. Allmendinger, both a Cornell professor and alumnus, says professors will bring introductory geology students to the gorge to visit the dyke. And while that concludes much of the bedrock’s story, it’s also just the start of the glacial one. Fast-forward all the way to just a million years ago. The glaciers from the north grew and grew until they reached Ithaca. The ice sheets continually covered and uncovered the land until they beat their final retreat about 14,000 to 15,000 years ago. When they did, Cornell’s campus, had it been there then, would have been covered by 200 feet of water. But the water from the melting glaciers didn’t have anywhere to go. To the north of Ithaca stood the towering glaciers. To the south stood a similarly impressive topography. This meant that the water just pooled, forming ponds. However, whenever the glacier retreated, that gave the water more places to go. The water levels would suddenly drop. As they did, rivers pounded through the landscape carrying water from one pond high up to another pond lower down. Each time the glaciers withdrew, it eroded a new step. In fact, Cornell’s punishing stair step-elevation campus can be owed to all these glacial beaches which formed throughout the process. And finally, fast forward to today. Things have all mellowed out. From towering glaciers and shallow Devonian seas, now you have numerous beautiful hikes to walk and gorges to visit. Have an amazing trip. As they say, it’s gorges!